Growing container bamboo is relatively straightforward and this page will provide you with a guide to some of the things you need to consider to be successful in planting and growing container planted bamboos. Some bamboo species are suitable to grow in containers if you don't want to put them in the ground. Or if you are like me and like to move you plants around the garden to get a different feel occasionally, bamboo in pots is an excellent idea! There is a list of some suitable species further down this page. Ensure your container bamboo pot, is large enough to leave a space of at least two inches between the root ball and the container, and choose a wider container in preference to one that is deep. The root growth is quite shallow and to plant in a deep pot wouldn't be so efficient as in a wider one. When growing bamboo in pots it takes a bit more effort to care for the plant. Watering is the main concern to get right. Plants in pots do not like to dry out completely, and neither do they like to be water-logged. Their placement in relation to the sun is important as the pots can overheat and damage the roots and care should be taken in the winter that the soil does not freeze solid and kill the plant. Dappled shade in midday sun and a position out of the worst frosted areas should be sufficient unless you live in an extreme environment where you may need to provide further protection. For more information on care of bamboos see my section on caring for bamboo plants and for propagation techniques see bamboo propagation. These are some examples of suitable container bamboo species. Chimonobambusa Tumidissinoda Walking Cane Bamboo from China - Aggressively spreads but can be kept in pots for control and makes stunning specimen plant in the garden. 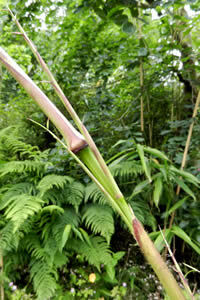 Culms have bulging nodes that make this bamboo stand out in a crowd. Tolerates shade. Maximum height: 6 metres (20 ft.) but 3-4 (10 to 13 ft.) more likely in containers. 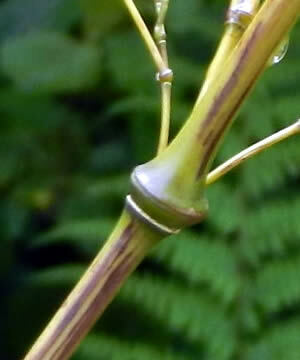 Culms reach a Maximum diameter of 3 cm (1.2 inches). Fargesia List of Species - Hardy to between -10C (14F) and -29C (-20F), predictable reliable clumping habit from 0.5 to 1.5 metres, different heights upwards of 2 metres, lots to choose from. Borinda papyrifera - Blue caned bamboo, still quite rare. Although these will reach more spectacular proportions in the ground. Hibanobambusa Tranquillans 'Shiroshima' - Very rare - Excellent screening or hedging with moderate spreading - 2 branches per node - Variegated cream and white striped leaves can grow to 10 inches long by 1 1/4 inches wide - Maximum height: 16' - Maximum diameter: 1 1/4"
Indocalamus latifolius 'Solidus' - Very good screening, hedging, and shade bamboo with aggressive spreading - Leaves are 8 to 10 inches long - Maximum height: 8' - Maximum diameter: 3/8"
Pleioblastus distichus 'Dwarf Fernleaf' - Excellent container or ground cover with very aggressive spreading - also makes a good hedging - tiny leaves that are sometimes only 1" long by 1/4" wide - Maximum height: 2' - Maximum diameter: 1/8"
Pleioblastus distichus 'Mini' - Excellent ornamental ground cover with very aggressive and rapid spreading properties - can be mowed - Maximum height: 1' - Maximum diameter: 0 1/8"
Pleioblastus shibuyanus 'Tsuboi' - Quite rare vigorous growing dwarf bamboo - good screening, excellent hedging with very aggressive spreading, also good attractive container and ground cover plant - small varying white or cream striped leaves - Maximum height: 9' - Maximum diameter: 1/4"
Pleioblastus viridistriatus chrysophyllus - Attractive excellent ground cover and container plant with aggressive spreading that also makes good hedging - golden yellow leaves with faint green stripes approximately 7" by 1 1/2" - can be mowed in winter - Maximum height: 3' - Maximum diameter: 1/4"
Pseudosasa japonica 'Arrow Bamboo' - Does well in containers and pots, indoors or outdoors, moderate spreading - leaves can be up to 12" by 1 1/2" - Will tolerate shade better than many other varieties - uses include making arrows as the culms are straight - Maximum height 18' Maximum diameter 3/4"
Sasa nipponica 'Ward' - Attractive excellent ground cover and container plant with aggressive spreading that also makes good hedging - green leaves that develop cream and tan coloured edges in autumn - Maximum height: 2' - Maximum diameter: 1/8"
Sasa veitchii 'Kuma Zasa' - Makes good and very attractive hedging but too short for screening - aggressive spreading - dark green leaves approximately 10" long by 2 1/4" wide that turn to a creamy white in autumn - culms turn purple or purplish green on maturity - Maximum height: 5' - Maximum diameter: 1/4"
Shibataea kumasaca - Excellent for a bamboo hedge and good for screening with slow spreading - leaves are short and broad - culms have slightly zigzag internodes and prominent nodes - Maximum height: 7' - Maximum diameter: 1/4"
Shibataea lancifolia - Good for ornamental hedging and screening with moderate spreading - longer and narrower leaves than other species - Maximum height: 7' - Maximum diameter: 1/4"
I have some Phyllostachys aureosulcata spectabilis in a large pot that seems to be doing alright. Although it can grow to 9 metres (30ft. ), with diameter of culms at 4.5 cm (1.75 in. ), being in a pot has restricted this growth a bit and the colourful spectabilis bamboo remains at a decent size for a small garden. The guide includes information on planting, stakes, soil type, season, spacing, sun, water, weeds, and mulch. Much of this information is the same for bamboo in the ground or in containers.